7,000 miles, that’s how far I was from home. We arrived late at night in Auckland on a plane from Brisbane, where we had just spent 5 glorious Aussie days with our friends Ryan & Alyssa. Read about my adventures in Australia! After a week spent in hot, sunny Australian weather, we awoke the next morning to rain. And went back to bed. 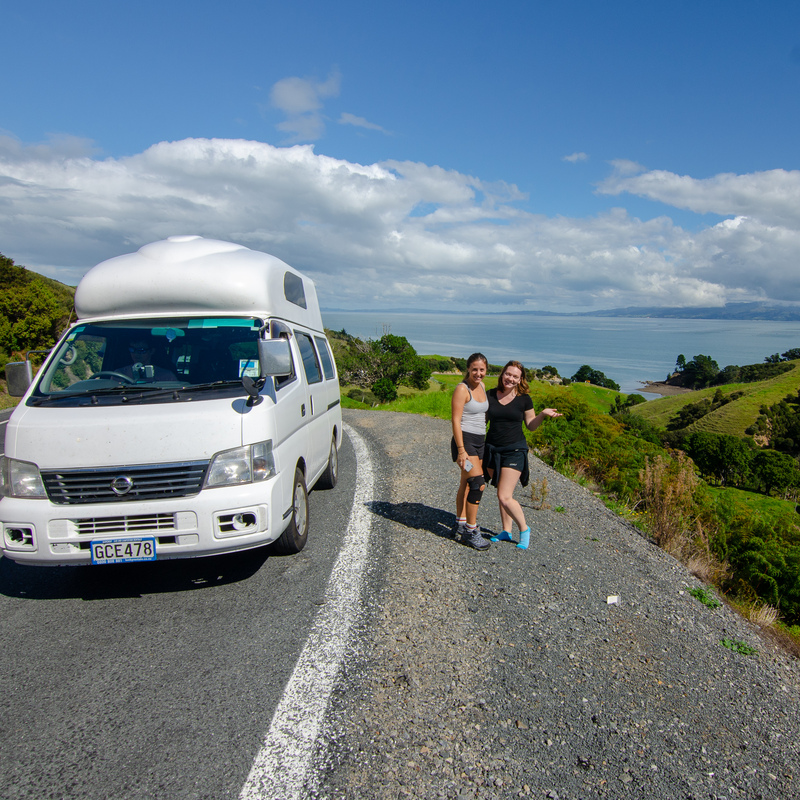 We eventually convinced ourselves to pick up our camper van, and although that was a longer process than we had hoped, we were soon off on our first journey: to The Coromandel. What was to come was two days filled with surprises, let downs, beauty and a little bit of chaos. We started our journey with one simple problem: we needed food. The camper van provided us the freedom to make at least some of our meals. It was outfitted with a fridge, a stove top and utensils. We left town in search of a grocery store, hoping to stock up before heading out into a more rural area. In no time we came across a promising grocery store, and pulled up in an empty parking lot. That seemed unusual, because it was around lunch time. Upon a closer look at the store’s signs, it appeared it was closed. The reason for a supermarket being closed in the middle of the day? It happened to be Good Friday. McDonalds it was! As we ate our fast food we reasoned to ourselves there was no way that all grocery stores could be closed. It seems we were wrong. We spent the day eating fruits from small stores until we could find a restaurant for dinner. Look at those blues and greens! Plan according to holidays or happenings that may be taking place while you’re traveling. We knew it was Good Friday, but what we did not know was that during Easter weekend all the small towns essentially shut down. That entire long weekend we struggled to find food, as each town had a slightly different schedule of when they were open and closed. Around three hours was the projection Google gave us for getting from our hotel in Auckland to our first destination in The Coromandel. That was not the case at all. Although some of the loss of time was due to the lack of speed our camper van had, it was mainly because we were blown away by the views. We hugged the coastline of the Firth of Thames on our way to Coromandel. It started with icy blue water and the greenest grass we had ever seen. The views then progressed into rolling hills, and viewpoints out into the distant water. It seemed like around every corner there was something even better, and we could not help but stop to take it all in. The problem? We had dinner reservations at a winery. It was clear by the time we got to New Chum Beach on The Coromandel that we would not be making those reservations. We decided to take our time at New Chum Beach instead of rushing, and were rewarded with a fun hike to get there, a beautiful beach and an amazing overlook that we stumbled upon. Add a few hours to your projected travel time when you are heading to The Coromandel. There are so many unexpected places to see, and you don’t want to miss out on things you already have planned! The next day we woke up later than we had expected. Our destinations for the day were the famous Cathedral Cove and Hot Water Beach. Parking was further than expected, and we needed a shuttle to take us to the trail head. That was sign number one that maybe this day would not go as planned. The paved trail down to Cathedral Cove was packed with people. Another sign. But all this was nothing compared to the masses of people we saw as we exited the final stairs to the beach. It seemed as if the entire North Island was at the most famous cove in The Coromandel. We took some pictures past the photogenic white stone stack, and headed back onto the trail. The true gem came on the way back, with the discovery of of Stingray Beach. It seems as if everyone had bypassed this equally as beautiful area in favor of Cathedral Cove. We spent time on the quiet beach exploring caves and walking beside the white cliffs. Next up was Hot Water Beach. Another famous beach in which, during the right conditions, you are able to dig your own “hot tub” in the sand. When we got there, it was even busier than Cathedral Cove. All the heated areas were already occupied. From our towels in the sand we watched others soak in their hot tubs. A bit of a let down, for what could have been such a unique experience. Sometimes it pays to wake up early, especially when it is a busy long weekend. The crowds could have been avoided had we visited the tourist spots early in the day. The first few days did not go quite as planned. We missed our dinner at the winery, food was more of an issue than we would have liked, and some spots were not exactly what they looked like in the pictures we had seen. But it all turned out okay, because we kept a positive attitude. With the turn of events we were able to find even better places than we had planned. We were able to take our time on the drive to The Coromandel and enjoy a restaurant dinner together after a long day of driving. New Zealand has such interesting trees and plants! Next up was a geothermal island located a boat ride away, and Lake Taupo, where we would have a sailing adventure! Read about that adventure on our North Island New Zealand Road Trip! Want more New Zealand? Check out my recap of North Island’s 5 Amazing Places! Picturesque and lush greenery are the two words that came to my mind while reading your article and seeing all the pics. How I wish to visit this part of the world. Those are two perfect words to describe it! It is a beautiful part of the world! Wonderful stunning pictures and I am totally in love with the Cathedral Cove. Nature never fails to surprise us. The Cathedral Cove was super unique, I just wish it had been a bit quieter! Nature has so many cool formations, in my opinion even cooler than man made ones! I lovee the Coromandel, aren’t New Chum beach and Cathedral Cove just stunning. I agree about checking public holidays where your visiting as most likely everything will be closed. They are both beautiful! We definitely should have done that in advance as we knew there were public holidays, but we know for next time! I’m dying to visit New Zealand! It’s so high on my bucket list! These stops look beautiful, especially the impressive Cathedral Cove! Love getting new ideas for the trip! I hope you get to visit soon, there really is so much to see on both of the islands! I loved all of your tips, especially have an adventurous spirit! This looks so beautiful and I am low-key dreaming of exploring NZ with a campervan now. Thanks so much! Despite the mishaps I always like to end on a positive! Camper van is the way to go in New Zealand! I would love to go to New Zealand. The pictures are stunning. A camper van would be a great way to get around and explore. It is definitely the way to get around and explore, because there is so much to see and so many rural areas! It seems like this trip down under was definitely a roller coaster! We can always learn so much from the challenges we face while we travel. It is always a roller coaster but that is what makes its fun! More learning happens than when things are straightforward and easy! Oh wow, this really brings back some memories! Stunning pictures! I visited NZ myself two years ago and are strongly thinking of going back when my visa expires here in Canada! Thank you for giving me this inspiration and hope you have an amazing journey! Where are you in Canada? I am originally from Canada! Thanks for reading, I hope you get a chance to return to NZ soon! The only Coromandel I knew before this post was the Chanel perfume! I had no idea it was a place in New Zealand, or that it was so beautiful. Did you do any swimming? I don’t think I could resist jumping in that turquoise water! I had never heard of it until you mentioned it, and now I keep seeing it everywhere!! We went swimming at New Chum Beach! Such stunning photos! I really like reading your honest account of travel- there is so much that can be learned from the things that do not go according to plan. You also bring up such a good point that I struggle with sometimes- the balance between leaving room for spontaneity in travel and also having enough structure to see all the things you set out to see. A never ending balancing act. Thanks so much for your thoughtful comment! It is definitely frustrating to have things go wrong during travels, but it makes for such good stories when you come home! The struggle is real- I am a planner so I always want to know what is coming next, but it is so special to see something you didn’t know was coming. Thanks for following along!!! I loved reading about your trip to Coromandels. You have taken stunning pictures, especially New Chum Beach. I am adding this place to my wishlist. Thanks so much, I loved New Chum Beach! Hope you get to visit soon!!! I was majorly disappointed with the number of people at HWB too, but the Coromandel is such a beautiful area! Glad to know I was not the only one who had this experience- I had so many people telling me that when they went it was quiet! It really is beautiful, we only got to see a fraction of what we wanted to during our time there! I never visited the Coromandel but it sure looks amazing.Your pictures alone are making me want to go there right now but your article was even better, I really enjoyed reading it. Keep up the great work! Thanks so much for the feedback on my article! It is always nice to hear that people enjoyed reading my stories! The Coromandel really is a special place! Loved the tips here for an amazing trip to the Coromandel. It looks beautiful. The Cathedral Cove looks outstanding. Its important to have an adventurous spirit and enjoy the journey with the breathtaking views, not to be in a hurry to get to the destination. Thank you! It is hard to remember not to hurry when sometimes it seems like there is so much to see and so little time, but it is also really special to allow the journey to unfold before you! OMG! Coromandel looks like heaven. New Zealand has always attracted my attention and now I wanna see Coromandel as well through your experience. New Zealand is a very unique place, and there is so much to see! The Coromandel is one of my favorite parts of the North Island! Thank you! I hope you get to see New Zealand soon! I am heading here in a few months so this is the perfect thing to read! That is so awesome, I love when people come across blog posts before they go, it is always great to have tons of info as everyone has differing experiences!